MakerBot 3D Printer ABS Filament, True Gray, 0.07"
Single 2.20 lb spool of True Gray PABS filament. MakerBot ABS Filament is good for detailed prints and can be used in conjunction with MakerBot Dissolvable Filament. The dissolvable filament acts as solid infill material. 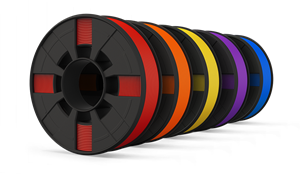 Every filament color is comprehensively quality tested at both 100-micron and 200-micron layer resolutions on the MakerBot Replicator 2X to verify that the filament will perform every feature that MakerBot Desktop software offers and reliably slice and print every type of printing.